In rocketry, what goes up usually comes down in pieces. The cost of getting to orbit is exorbitant, because the rocket, with its multimillion-dollar engines, ends up as trash in the ocean after one launching. Elon Musk, the chief executive of the Space Exploration Technologies Corporation, better known as SpaceX, likens the waste to throwing away a 747 jet after a single transcontinental flight. “Reusability is the critical breakthrough needed in rocketry to take things to the next level,” Mr. Musk said in October during a talk at the Massachusetts Institute of Technology. On Tuesday, his company hopes to upend the economics of space travel. At 6:20 a.m. Eastern time, one of SpaceX’s Falcon 9 rockets is scheduled to lift off from the Cape Canaveral Air Force Station in Florida on what is otherwise a routine unmanned cargo run to the International Space Station. But this time, the company will attempt to land the first stage of the rocket intact on a barge floating in the Atlantic Ocean. After the booster falls away and the second stage continues pushing the payload to orbit, its engines will reignite to turn it around and guide it to a spot about 200 miles east of Jacksonville, Fla.
SpaceX has attempted similar maneuvers on three earlier Falcon 9 flights, and on the second and third attempts, the rocket slowed to a hover before splashing into the water. So SpaceX built a floating platform, 300 feet long and 170 feet wide, for the rocket stage to land on. April 18, 2019 - Toppled SpaceX Falcon Heavy booster arrives at Port Canaveral Florida TodayUnder the cover of night, the center booster of SpaceX's three-core Falcon Heavy rocket sailed into Port Canaveral on a drone ship early Thursday. April 11, 2019 - SpaceX Falcon Heavy Sticks Triple Rocket Landing with 1st Commercial Launch Space.comSpaceX's Falcon Heavy completed its first commercial launch on April 10, lofting a communications satellite called Arabsat-6A into orbit. April 11, 2019 - Watch SpaceX Attempt a Triple Rocket Landing During Falcon Heavy Launch Today! Space.comSpaceX will attempt to pull off the first triple rocket landing during the launch of its first commercial Falcon Heavy mission today (April 10). Here's how to watch. 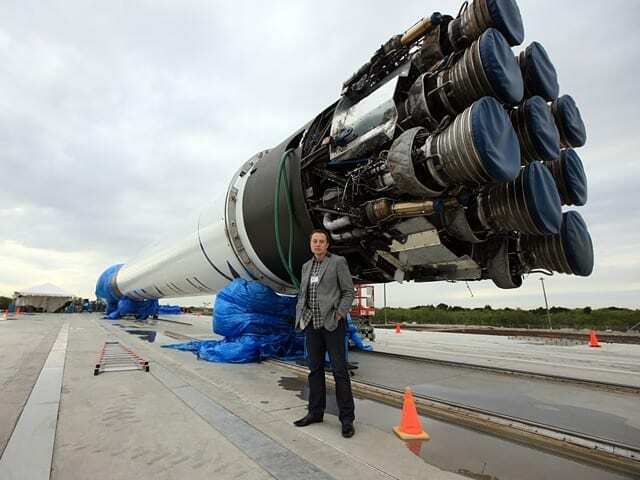 April 18, 2019 - Parts of SpaceX Booster That Fell Over at Sea Recovered News 13 OrlandoParts of the leaning booster were brought back to Port Canaveral on Thursday. April 13, 2019 - In Photos: The Amazing Triple Rocket Landing of SpaceX's Falcon Heavy Launch of Arabsat-6A Space.comSee photos of SpaceX's historic second Falcon Heavy rocket launch on April 11, 2019. April 12, 2019 - NASA Chooses SpaceX to Launch Asteroid-Walloping Mission Space.comA SpaceX Falcon 9 rocket will launch NASA's Double Asteroid Redirection Test spacecraft in June 2021, agency officials announced Thursday (April 11).